1. There is exactly 1 month left until Labor Day, the official end of my summer (and sanity). 2. Some of the time I spend with Google Reader should be used towards studying for my first actuarial exam. 3. I could and should be more economical. Well, I can’t stop time and my exam’s not ’til January (so what if it’s another $200 each time I might have to retake it?). And then there’s #3. Ah, the ever-ubiquitous #3. How often do you hear people vowing to save money, stick to a budget, give up their first-born frivolous indulgences? Unfortunately, I don’t see neither my addiction to clothes shopping nor my weekly purchases of organic produce and the occasional expensive superfood (i.e. cacao nibs, my new breakfast staple) being surrendered any time soon. Instead I’ll opt for an easier, short-term plan to tackle this issue: cooking economically. For me, this means cooking with backyard ingredients, cooking from the fridge, and cooking in bulk. Other than tomatoes, Mom’s garden out back is also brimming with cucumbers, eggplants, hot green peppers, butternut squash, long string beans, green onions, chives, and mint. We pick them when they’re ripe or when we need them. Sometimes our fridge gets taken over by heaps of these little (or big) devils because they just keep growing and growing! Aside from lacking population control, it’s also as organic and local as it gets around here. Speaking of the refrigerator, it’s the source of inspiration for almost all of my meals. Note that when I say “refrigerator”, I’m not talking about the freezer. 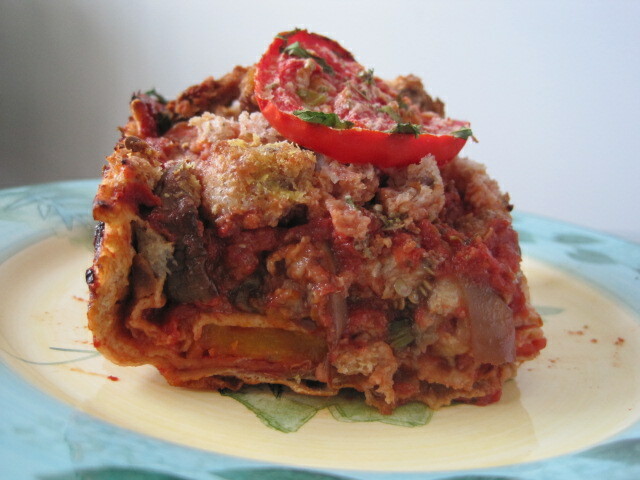 Using fresh, not frozen, ingredients makes it more likely that the key ingredients in my meals are from our backyard. When I worked at the Hut last summer they all came prepackaged from the freezer cart. USA 0, Australia 1? 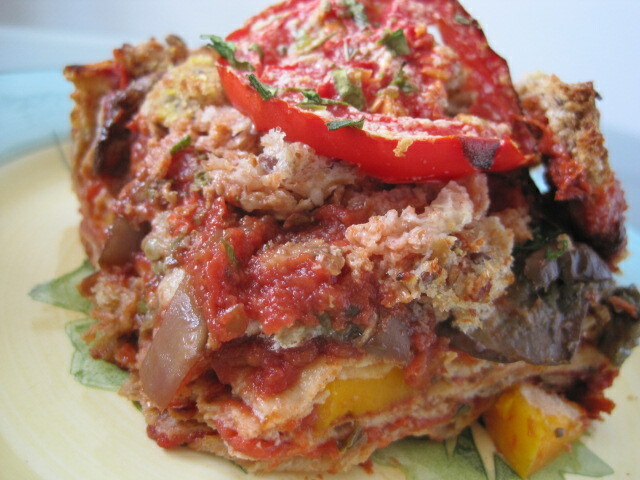 Frozen foods, including prepackaged entrées, are usually a lot pricier than their fresh counterparts. 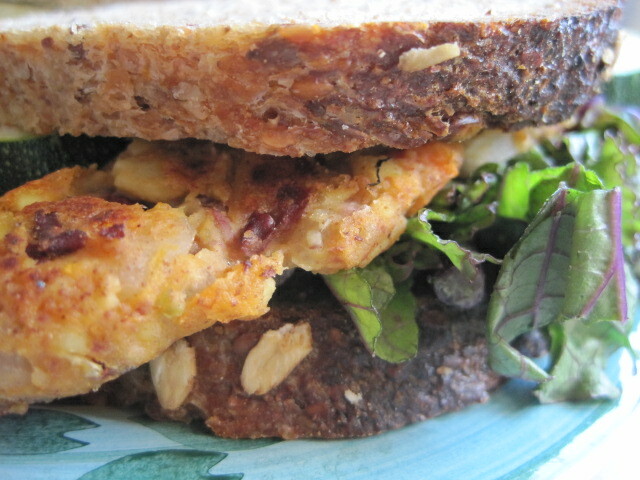 That’s why I’ve stopped buying frozen veggie burgers and started dabbling in homemade versions. Of course, I’m not always going to have the time to make convenience foods from scratch, but I try to do so when I can, every now and then. And, as I’ve mentioned before, at least once a week I make a large batch of whatever I’m eating, to share with my parents and sister, if she’s home. (Yes, all of those pictures you’ve seen with multiple bowls of food really aren’t all for me!) If you recall, I also made a large potful of stew before our kitchen renovations started, and that lasted me a good 5 meals or so. When there are veggies about to rot in the fridge, that’s another cue for me to start making ginormous everything salads–you know, the stuff I eat basically every other day. Cooking in bulk is actually more of a time-saver than a money-saver, but hey, time = money, right? So… it seems like I’ve already been cooking economically after all. But let’s face it, the vitamin-packed messes that I shove into my mouth are not the most creative and appealing of foods. 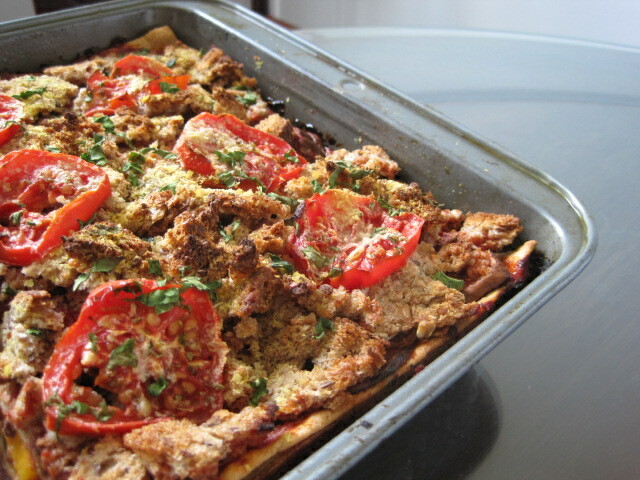 What I’m looking for now is something that’s not just budget-friendly and nutrient-dense, but also a guaranteed crowd-pleaser for vegans and omnivores alike. This one’s a winner, folks. Step 1: Preheat oven to 400 degrees. 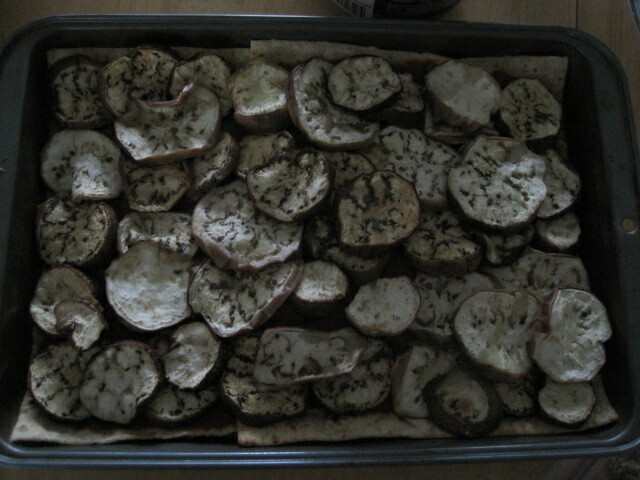 Slice the eggplants into 1/4-inch thick rounds and arrange on a baking sheet lined with greased foil. Sprinkle with salt and drizzle with olive oil. Roast for about 20-25 minutes. 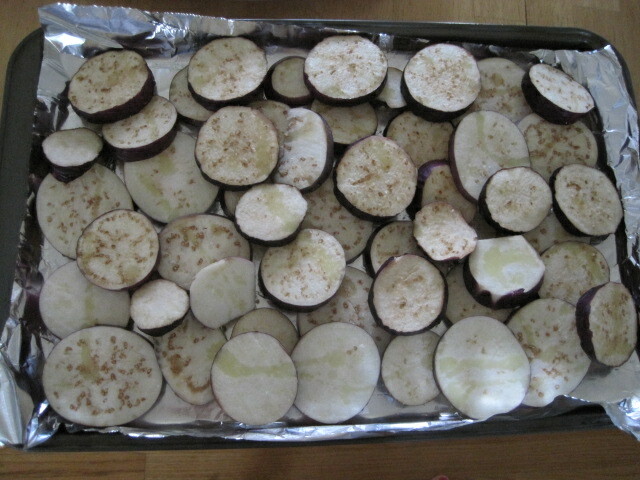 The eggplant should come out slightly browned and shrunken. Allow to cool for a few minutes. 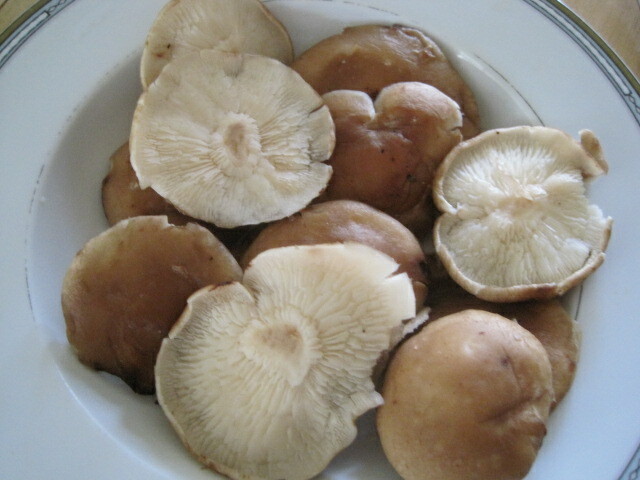 Step 2: Meanwhile, wash and gently scrub mushrooms to rid of dirt. Remove the stems but don’t chop the caps. 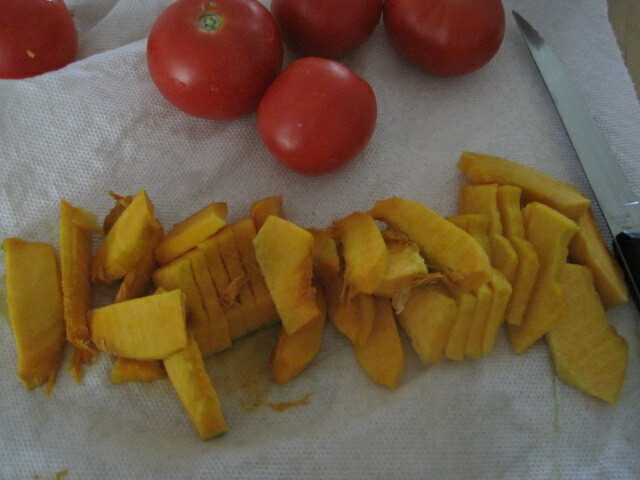 Wash the squash, remove the peel, and chop into relatively thin pieces. Step 4: Preheat oven to 400 degrees. 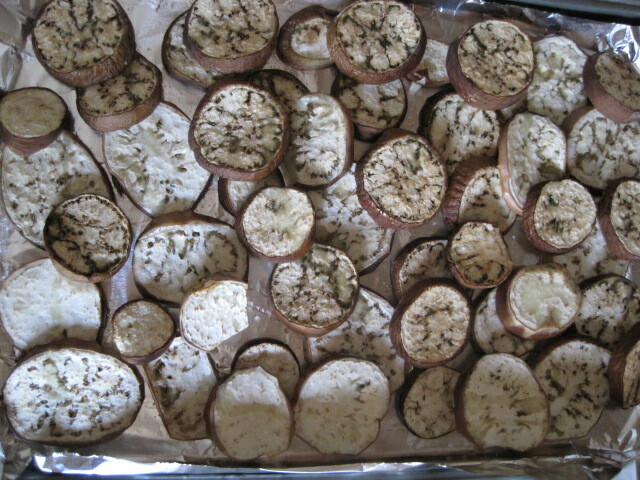 Toast 4 slices of bread, let them cool for a bit, and put in a sealed ziplock bag. Use hands or rolling pin to crush into pieces. If using a food processor, give it a few spins until you get coarse breadcrumbs. 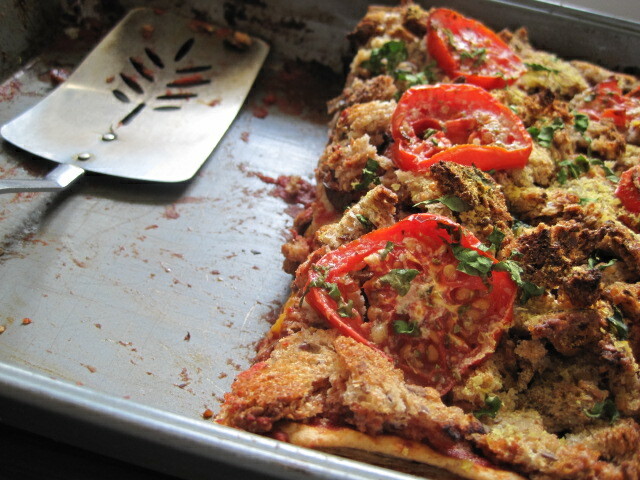 Slice up tomatoes to yield 12 slices. 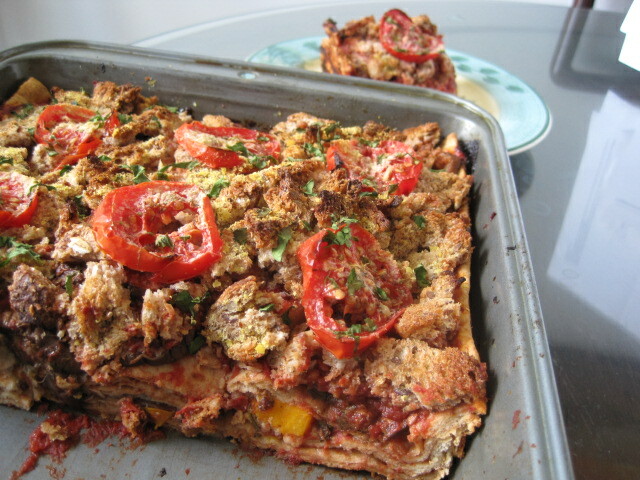 Cover the eggplant/crushed tomatoes layer with the bread pieces, generous shakes of nutritional yeast, and salt & pepper to taste. 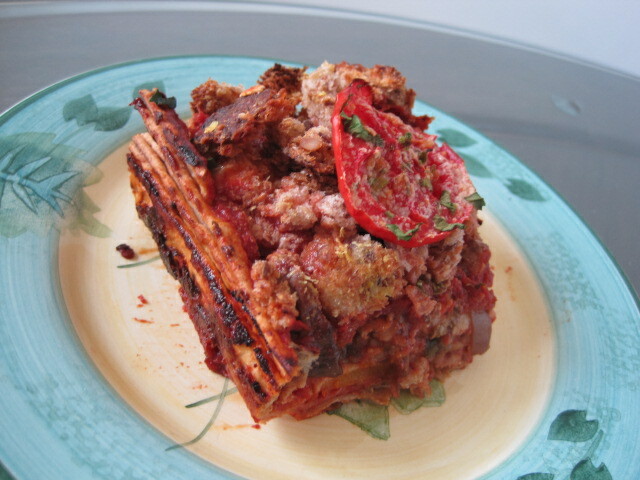 Top it off with the tomato slices, placed 3×4. Sprinkle on basil or parsley if desired. I don’t have either (gasp) so I just chopped up spinach to imitate the fancy green look. Nobody will know. 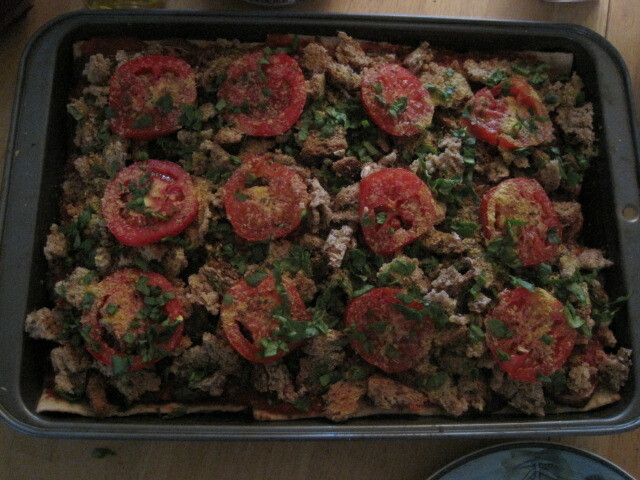 Bake for 30-40 minutes, until the bread topping is browned and the tomato slices slightly shriveled. We didn’t have the range hood up yet, so as this baked the entire kitchen got pretty hot. I’m kinda glad that there wasn’t a range hood to blow away all the heat and oil fumes, because let me tell ya–the room smelled amazing. 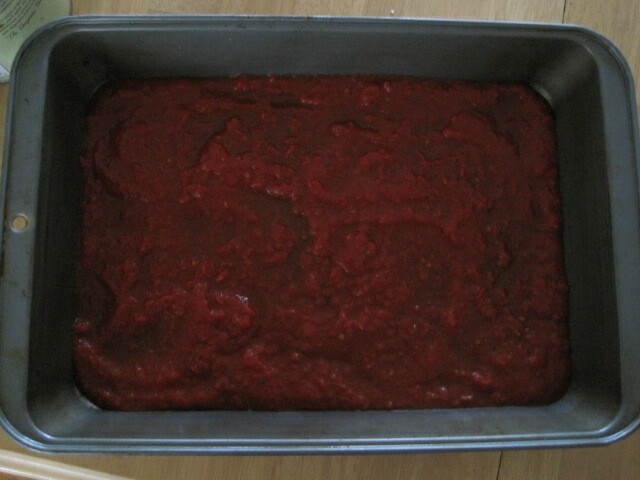 The first thing I smelled was tomatoes and cheese, as if a pizza was baking. Ah, the wonders of nooch. 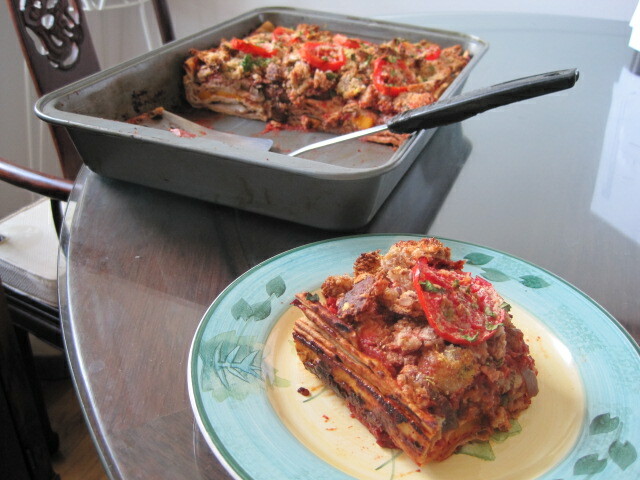 No one would’ve guessed that it was vegan lasagna if they walked into the room. 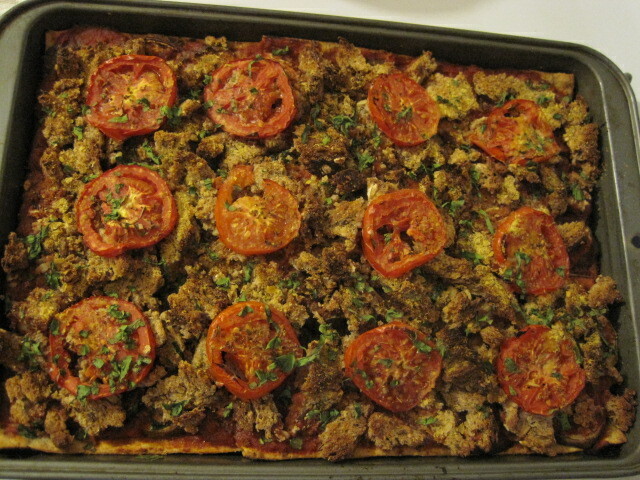 The three of us each had 1 slice each for dinner last night, cut between the tomato slices (really good tip for portion sizes). 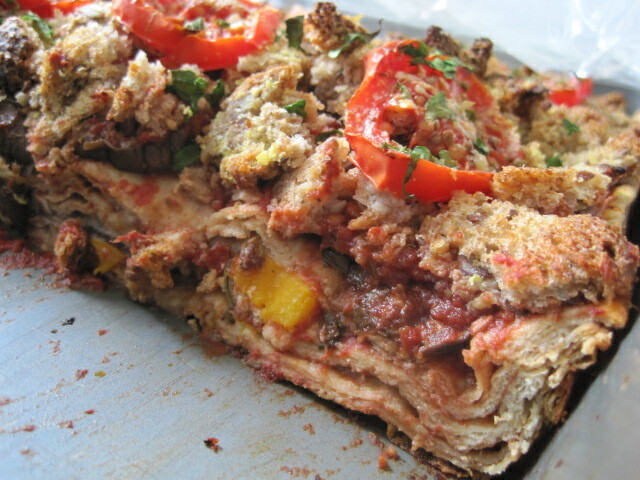 and I also had a slice for lunch. 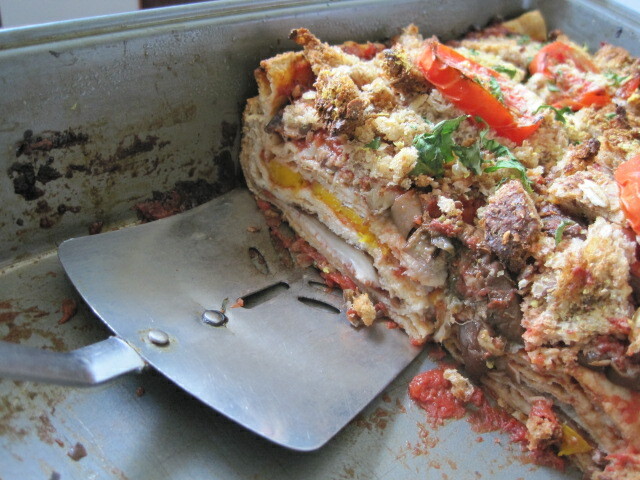 No cheese, no meat, and no lasagna pasta. Cooked with backyard ingredients? 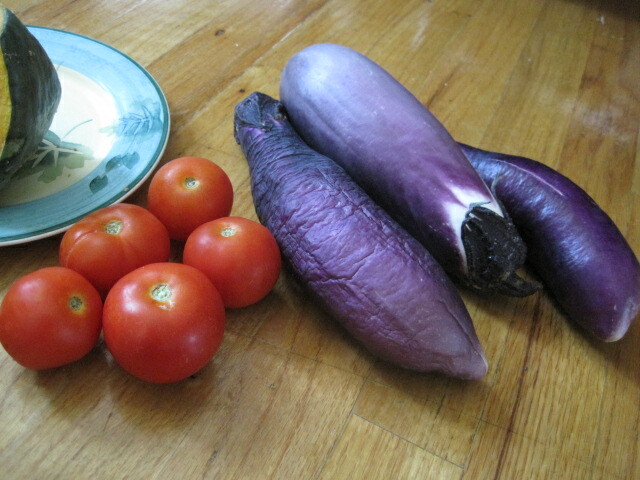 The eggplants (the wrinkly one has “character”) and tomatoes (whole) were freshly picked from a farm 10 feet away. 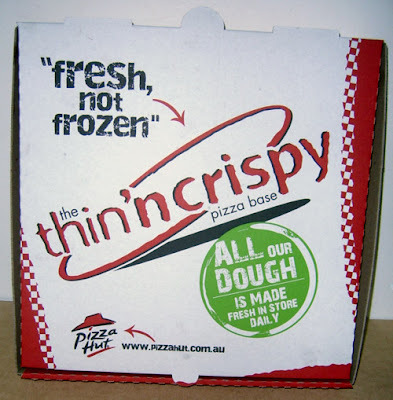 Cooked from the fridge? 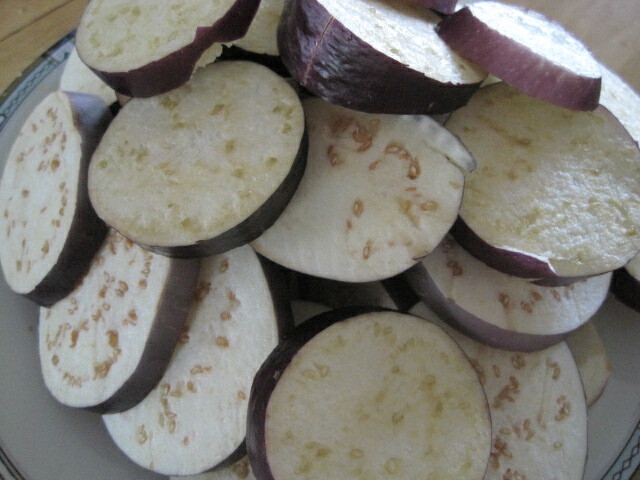 I found the eggplants, tomatoes, kabocha, and shiitakes when I opened the refrigerator door. The wrinkly eggplant was begging to be used, and as you know, I can’t turn down the last plea of any elderly being. 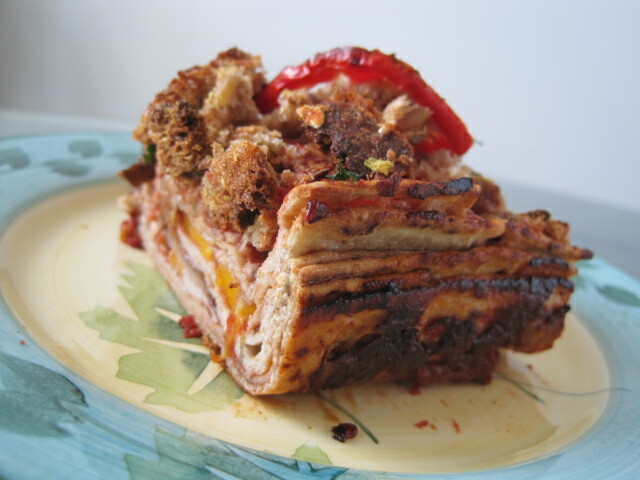 Also I didn’t have pasta so instead I just used what was available in the fridge–bread and wraps. Cooked in bulk? If I could, I’d eat all 12 servings myself. In one day. Oh yes. 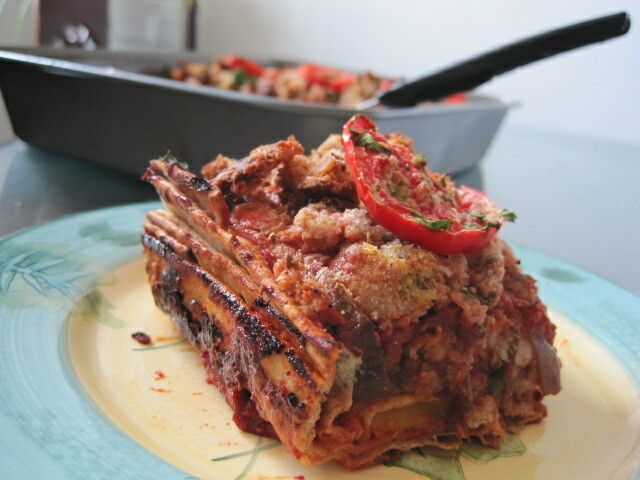 Lasagna for lunch again tomorrow? That’ll work, too. P.S. Speaking of economical… some extra spending money never hurts–enter Jenny’s $40 CSN giveaway (ends Aug 15)! And for a chance at free yummies, enter Amber’s Cavewoman Bars giveaway (ends Aug 13)! 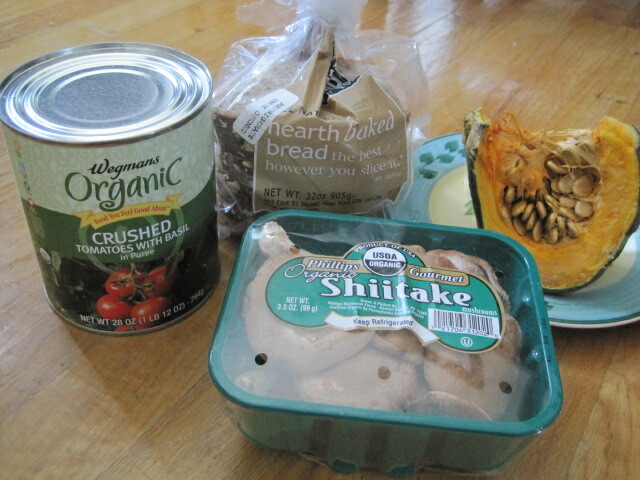 The food journal of a 19-year-old college student, vegetarian dabbling in veganism, and oatmeal and hummus lover.